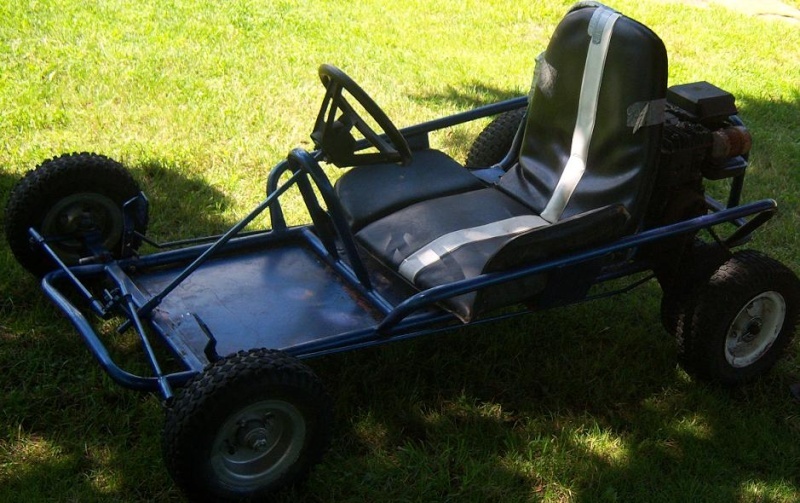 Bought the go kart for $120 not running but engine started. The left rear wheel spun around on the axle because the axle was threaded but stripped and worn and there was nothing to keep it from falling off. Got $10 in parts at hardware store (key for keyway for left rear hub, cotter pin, washers and 2" length of 1" galvanized pipe). I drilled a hole at the end of the axle for cotter pin to hold wheel on, put the pipe and washers (for spacing wheel out from the frame) on the axle and I put a 1/4" key ($.85) in the key way on the axle and reattached the tire. Fixed, and it holds after a couple of test runs. I ordered a gas cap ($6) and tube for one of the tires ($10) both from ebay. The cabinet, parts, pc and monitor were just sitting in the basement doing nothing. The wife's pc was replaced by a laptop weeks ago. I bought the cab for $75 bux a year ago. I had to buy a new video card for the pc ($20bux) as the old one was undperpowered for Mame. I installed Micro Xp, Mame, the roms and Mala for a frontend (all free). 4th of July 2009 should be lots of fun!